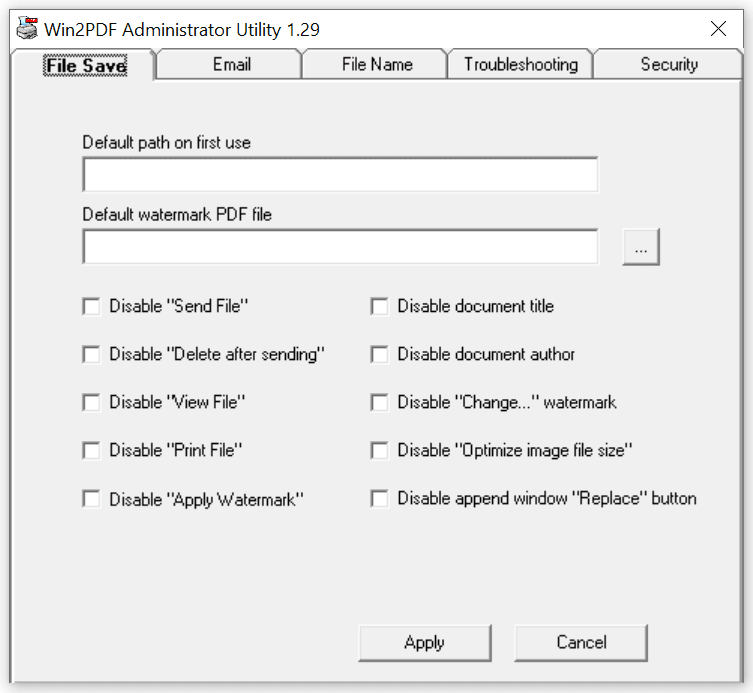 The first tab of the Win2PDF Admin Utility allows you to set defaults for the initial default path and watermark (Win2PDF Pro feature only), and to customize the options that are available on the main Win2PDF file save window. Default watermark PDF file: [Win2PDF Pro feature only] This allows you to set the default watermark PDF file. This fill will always be set until the user changes the file, and then the new file will be remember for successive uses (until change). If you click on the [...] button, you will be able to browse and select the default watermark PDF file. Disable [feature]: When any of these options are checked, the feature will be disabled ("grayed out") in the Win2PDF file save window. For example, if you checked the "Disable Send PDF" option, the user would not be able to change this option through the main Win2PDF file save window interface.